Looking for a place that was large enough for daffodil gardens took some time. We had a horrible time finding a lot that was bigger than the house that it was built on, and then a nightmare of a closing that took “seven” months because of the idiots (a developer) that were buying our house in North Carolina kept stalling and delaying. But we finally closed in early December 2018. I no longer will take it with a grain of salt when people tell me their horror story’s of planting in the winter; frozen ground that has to be broken before the bulbs are planted; cold, sleet, snow, rain and high winds. Resulting flu. I have now experienced it all. I think my planting was done in the middle of a couple winter storms. I’m happy to say I was fortunate to be able to purchase many of Clays downsized bulbs and planted them in new raised beds that I had built in Spring. 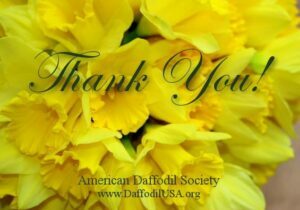 Thank you Clay for offering your babies to other daffodil nuts. My desire was to get them in the ground before the WA state winter hit. In the ground in Oct/Nov while we had mild weather. Winter finally hit here Monday Feb 4th. Got down to 15 Deg F and 1″ of snow. That is about as cold as Western Washington gets. Many of my standards and 2010 seedlings are up about 3″ with frozen leaves. At least the flower buds are still buried. My Rijnveld’s Early Sensation which is my earliest bloomer outdoors bloomed Feb 1st. Most years it blooms on Feb 20th. Looks like Western WA spring is 3 weeks early this year.